Tire replacement is the largest single operating expense for skid steer fleets, and a significant maintenance cost for most of the mobile equipment in scrap yards, transfer stations and recycling facilities. Putting new rubber on skid steer loaders, telehandlers and forklifts can be expensive; and even more so for large machines such as wheel loaders and wheeled excavators. Your choices include numerous makes and models of pneumatic tires, solid rubber tires and foam-filled tires. Increasingly, for many users a solid rubber tire solution is a popular way to go but there are a number of factors to consider before you buy. Buyers, with the help of their tire specialist, should evaluate surface conditions on which the equipment operates, type and severity of debris the tires will encounter, duty cycles and turning patterns that the equipment typically follows. The most desirable tire characteristics can also vary with the type of equipment they are mounted on. Most transfer stations and recycling centers move their material over a hard surface such as concrete or asphalt, ideal for puncture-proof, long-life solid tires. Make sure you have the right tread patterns matched to your specific applications. Working on an unimproved surface brings other variables into play such as traction and floatation. This could also weigh more in your decision than durability. Here, pneumatic tires may be your better choice, especially if you upgrade them with a foam fill. Foam-filled tires are the recommended flat-free solution for machines that get few operating hours or are nearing their end-of-life. When evaluating solid tires for a waste facility, sidewall impact resistance is critical to uptime, ride comfort and stability of a machine. Waste processing facilities offer no shortage of hazards to the life of your tires. Foremost is scrap metal and debris that will puncture and tear the tread and sidewall, as well as shredded material and abrasive filings that will cause extreme wear. In sites where any kind of liquid tends to spill on the floor, even water, tires will be subject to more wear than on a dry site. Dry or wet chemicals on the surface present a further threat to tire life. You may not think of uneven surfaces or cracks in the floor as an impact hazard, but these small variations in the pavement can add up to significant and costly tire wear when the impact is repeated frequently in a high traffic corridor. The wear and stress on a tire can vary widely from one area of a facility to another, depending on how the machine is driven and the routes it travels. Machines that work extended hours over long, straight distances will show an even tread wear pattern, although the tires may be subject to heat gains at higher speeds. In confined areas that require tight frequent turns, the stress will impact the sidewall structure and the edges of the tire. The vendor you buy from is often just as important as the tires you choose. With so many factors to weigh for so many different types of equipment, it's helpful to have a vendor with a broad scope of products from their Original Equipment Manufacturer (OEM) to address all of your equipment requirements. It's a good thing to have a dealer who is willing come on site to evaluate your operating environment and see how the equipment works together. That way, your tire dealer will be able to make the best recommendation for the right tire for the right application. So, what's the best tire for your application? There is no standard solution. A qualified vendor will come on site and provide the diagnostic insight that lets you make the right choice for your bottom line. Forklifts: For typically intensive load-carrying duty cycles, look for tires that provide a stable ride with the durability for flat free service. Wheel Loaders: Traction and durability are key factors to keep loads moving, with dependability to minimize cost per operating hour. Wheeled Excavators: Excellent tire stability is essential for lifting and swinging heavy loads, plus resilient ride quality to absorb shocks to the axles and reduce operator fatigue. Skid Steers & Telehandlers: With their multipurpose attachments, the tire needs for these versatile machines will vary according to their actual application. In most instances, though, durability and traction are your key performance metrics. The Camso TLH 792S are one of the best options for telehandlers performing in a scrapyard thanks to its stability, strength and durability. 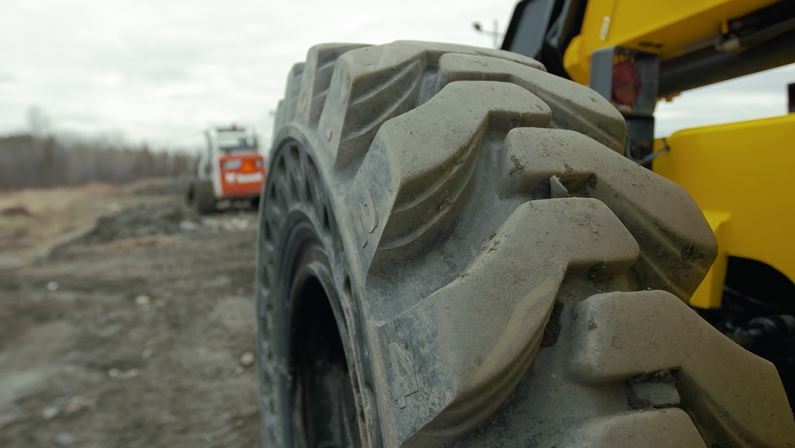 Watch how these extreme-duty solid tires perform in a French scrapyard and how they help this company increase its productivity.